Here's a small gift for you: 'Guisin-dong', a short fiction I wrote a couple of years ago (part of my collection of Seoul 'dragedies' in English). Frankly, you don't want to visit Guisin-dong. Even I, who visited every single Seoul neighborhood, never set foot there. 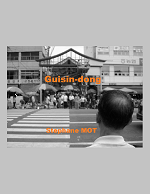 Now that you've been warned, you can download it for free, right here: Guisindong2012StephaneMOT. Any comments and critics are welcome (e.g. on this site, on the Facebook page, on Amazon...).